But sometimes you find a wine (or in this case two) that is so interesting that you create a meal to highlight that specific wine — wine, and then the food. When we cater events for wineries we’re often asked to do just that — create a meal to highlight a specific wine (like when we made this awesome smoked sausage and lentil soup to match a specific Pinot Noir from Willakenzie). Challenge accepted! 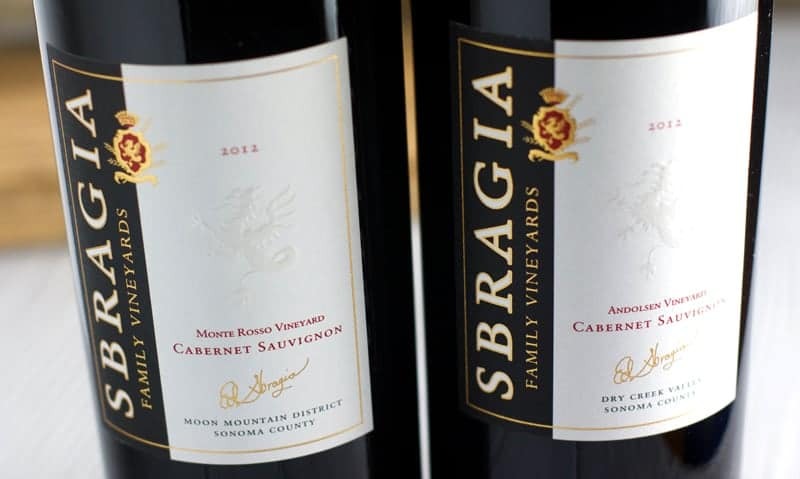 We recently sampled two different Cabernet Sauvignons from Sbragia (in Sonoma), from two different vineyards, that were both screaming for some steak love. When we first tasted the wines we kept conjuring up various ideas to pair — braised short ribs, Beef bourguignon, or maybe even something like this smoked pork tenderloin with blackberry bourbon sauce? But it became evident these wines really wanted a perfectly grilled steak. They didn’t need a rich or fatty cut, like prime rib. The wines aren’t overly tannic, therefore didn’t need much to mellow them out. The Andolsen Vineyard had lots of rich chocolate and blackberry and black cherry fruit and a touch of mint. It was full-bodied with a luscious texture with some fun spice notes coming out in the finish. The Monte Rosso Vineyard was richer in body and texture, with more structured and noticeable tannins coming through. I got a lot of cedar, savory herbs, along with rich berry fruit (blackberries, currants) and some rich cherry aromas and flavors. This wine was complex, rich, and savory. Though this has the potential to age for another 10-15 years or so, it’s also intriguing right now. 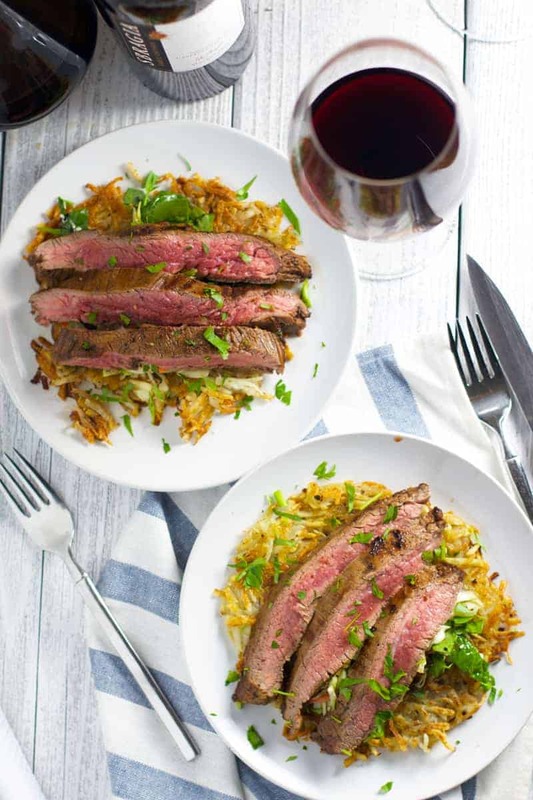 So, instead of creating a complex dish that would have the potential of competing with the complexities of the wine, we kept it simple and went with one of our favorite cuts of meat – the flank steak. We love flank because it’s fairly lean and cooks quickly. It’s great alone or as a sandwich. For this meal we cooked it simply, with some olive oil, salt and thick ground pepper flakes. We grilled it to med-rare (at the opposition to the hubby who wanted it rare), sliced it thin, and served it with a crisp potato cake and some fresh greens. The potato cake was inspired by this date night at home dinner. It’s an awesome touch to salmon, steak, or really anything. It provides a nice crispy texture, and some savory flavors to any meal. The char of the meat and its savory flavors were spot on with the rich fruit and spicy flavors of both wines. Incidentally this would be a fantastic meal to make for a date night at home dinner for Valentine’s Day. But let’s not kid ourselves; this meal would be awesome any night of the week, date night or otherwise. Oh, it would also be a nice light summer dish. Just grill that bad boy on your outdoor grill and serve up with some greens. Yum. Which reminds me, is it summer yet? Do you ever create a meal to highlight a specific wine? What was one of your most memorable?? Want more wine and food pairing ideas? Check out the recipe index. I love to create meals based on wine. My favorite pairing so far has been a Pork Chop with Cherry Sauce to pair with a Lange Estate Pinot Noir grown on volcanic soils! I like that “wine-forward” meal planning, especially if you find a bottle you really love at a tasting. I love flank steak as well and just made it tonight for dinner, in fact. Now I wish I had this wine to go with it! I just realized that I often start with the wine and then decide on a food pairing, but I think that’s mostly just because of the nature of what I do for a living. 😉 My fave pairing so far was a client’s Merlot that I paired with wine braised short ribs. 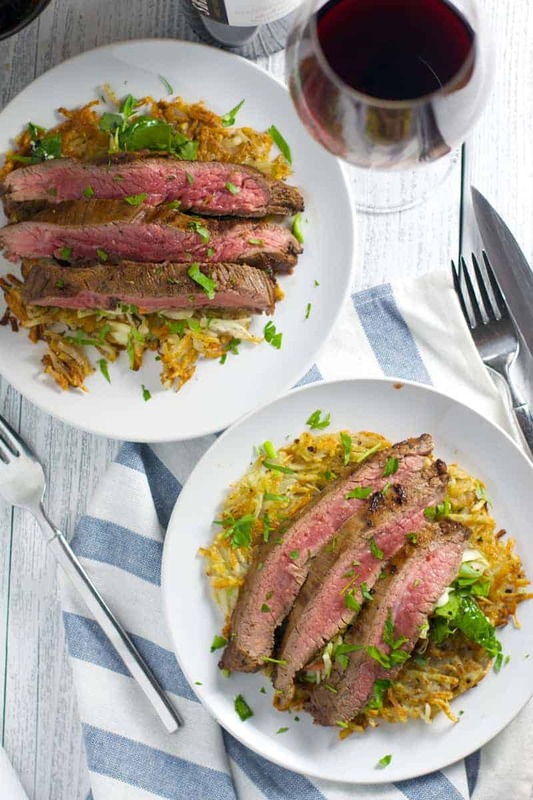 I love how you served this flank steak with a potato cake! Oh gosh, now you have me craving braised short ribs!!! Perhaps that will be my VD dinner this weekend??? Beautiful photos, that looks delicious!! Sounds like a good combo! I love this idea! I’ve never done it but now my wheels are turning about a ‘reverse pairing’. The flank steak looks amazing. Thanks! It’s so much fun to plan a meal around the flavors of a wine! Thanks! And I agree, I LOVE love love Sonoma!! What a beautiful dish! I love pairing wine with meals and Cabernets, being one of my favorites, always lend themselves to complementing a beef or lamb dish. I love the addition of the potato pancake too – great idea! Thanks. Those potato cakes are awesome!